1950s (exact date unknown): A 9-hole Tall Pines course is started on the Deptford side. 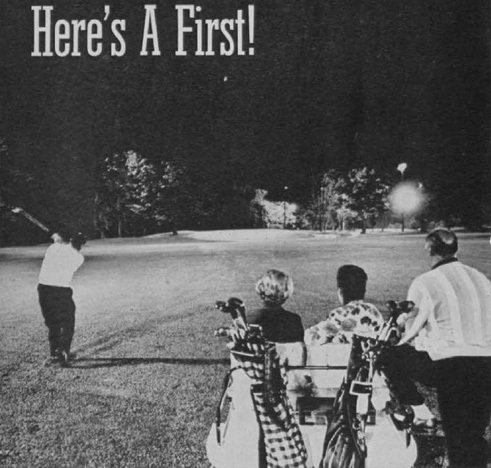 1963: Becomes the first lighted regulation golf course in the world. 1965: Expanded to an 18-hole course by addition of land in Mantua. 1984-1996: Becomes Ron Jaworski's Eagle's Nest, the first of many courses owned by the former Philadelphia Eagles quarterback. 1996-2006: Operated under the name Maple Ridge, but still owned for most of this period by Jaworski. In December, 2006, the golf course closed. The new property owner, GIBG, soon filed applications to build 94 homes in Deptford and 29 homes in Mantua. During 2007, preliminary approvals were granted in both townships. However, due to a downturn in the housing market at that time, GIBG was unable to quickly advance to construction. night golf at Tall Pines. 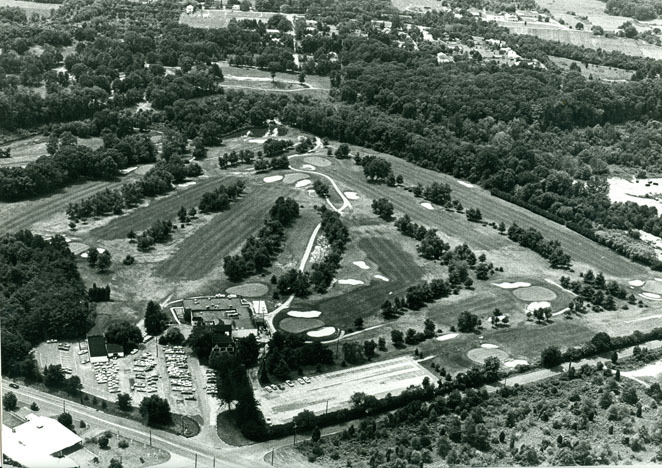 Aerial view of Tall Pines Golf Club, date unknown. 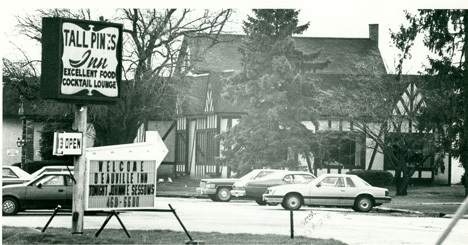 Tall Pines Inn, a restaurant which shared the golf course property, date unknown. 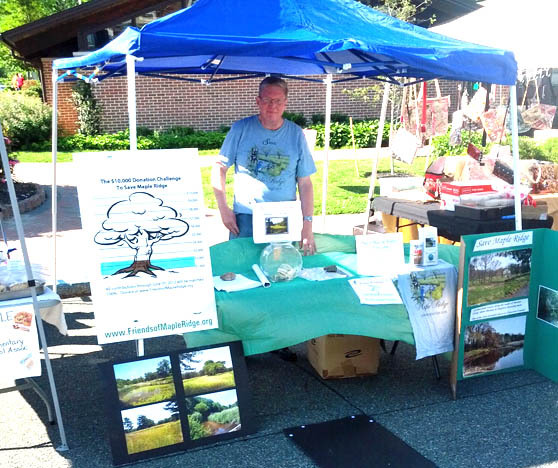 In January, 2008, Wenonah resident Chuck Forsman enlisted the support of the Wenonah Environmental Commission (WEC) for his idea to have Gloucester County acquire the property as open space. As a golfer and longtime land preservation advocate, Forsman recognized both the unique natural beauty of the property and what could be lost if it were to be developed. Wenonah residents, in particular, were concerned about additional road traffic through the small borough, as well as potential degradation of Mantua Creek on the borough's western edge. 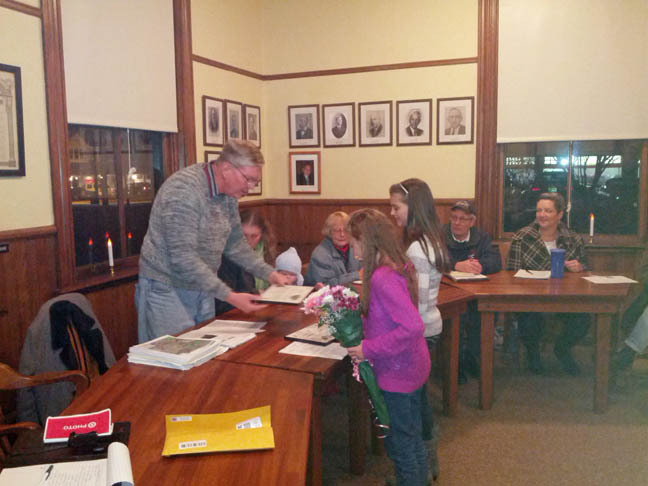 The Gloucester County Nature Club was an early and enthusiastic supporter of the project. As a non-profit with a nearly 60-year track record in the community, the club set up a fund to receive public contributions. Club members who were knowledgeable in birding and botany toured the property, cataloging the species they found. Early lists showed 67 bird species, 40 tree species, and 13 types of shrubs. The meadow habitat that developed after the golf course closed clearly was attractive to wildlife. The varied topography of fields, rolling hills, wetlands, and the Mantua Creek was also attractive to people, who walked the serpentine golf cart paths despite “No Trespassing” signs. From the beginning of the preservation project, keeping this unique combination of attributes in the form of a passive recreation nature park was the end goal. Soccer fields and baseball diamonds were not the highest and best uses of this land. Within a few months of Forsman's initial outreach efforts, the environmental commissions and governing bodies of Wenonah, Deptford, and Mantua all expressed at least symbolic support for preservation. Owner GIBG was willing to sell, but did not halt its development plans. 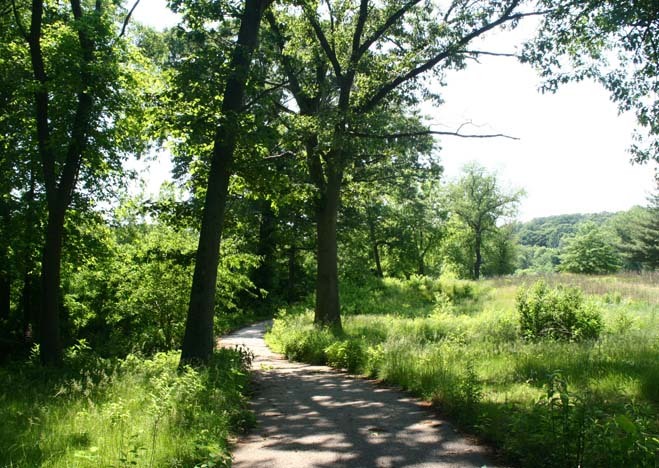 Mantua Township proposed an open space tax increase to help fund acquisition of at least its 49-acre portion of Tall Pines. However, Mantua voters narrowly rejected the ballot question in the November, 2008 election. A second attempt to pass the ballot question failed in November, 2009. Meanwhile, the County determined that it could not commit funds to Tall Pines due to a backlog of other land preservation projects, and was unwilling to create a new County park. 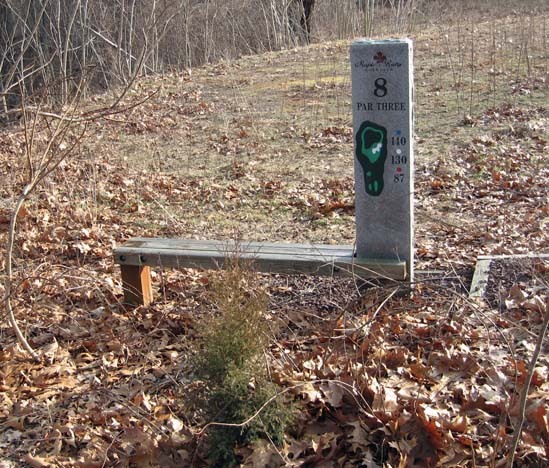 Maple Ridge Hole 8 marker in February, 2008. Maple Ridge scene in May, 2009. In early 2010, Forsman and WEC Chairman Rich Dilks sought advice from organizations with land preservation experience, including the South Jersey Land and Water Trust (SJLWT) and the New Jersey Conservation Foundation. It was decided to hold a public hearing in April under the auspices of the WEC. Residents and officials of all three affected municipalities were invited, as well as SJLWT's Suzanne McCarthy and John Flynn of the NJ Green Acres program. 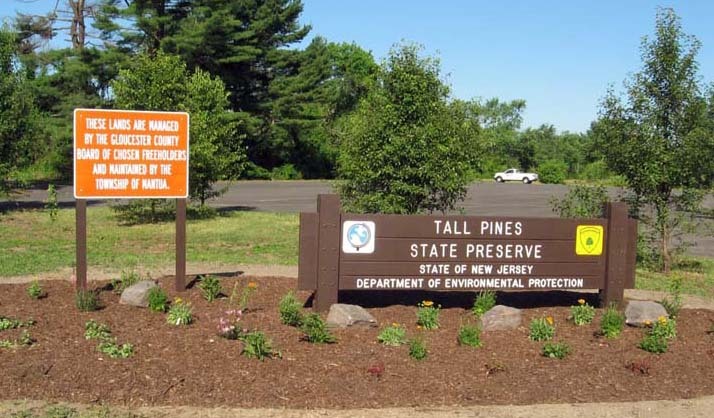 During the nearly two-hour hearing, attendees learned the nuts and bolts of land preservation in New Jersey and how they applied to Tall Pines with its three interested local governments. While many ideas were discussed, the most important was the formation of a new citizen preservation committee. 11 individuals then met the next month, elected Dilks as chairman, and chose the name Friends of Maple Ridge (FMR) to align with the last name of the golf course. The new committee was composed of residents of all three municipalities including representatives from all three environmental commissions, the Nature Club, SJLWT, and the Master Gardeners. Work proceeded along several tracks simultaneously, including: identifying funding sources, raising public awareness, and soliciting public contributions. 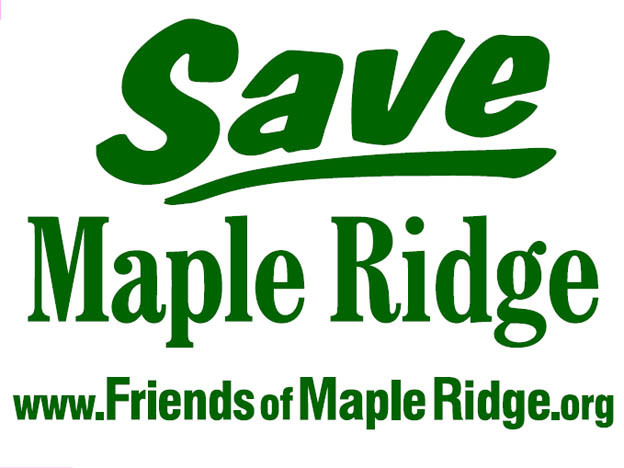 By September, 2010, “Save Maple Ridge” lawn signs and brochures were being handed out by FMR volunteers at local fairs and festivals. Petitions asking all levels of government officials to support preservation were circulated as well. Online outreach efforts through the Web and Facebook began at the same time. Research revealed several possible avenues to preservation, but one stood out from the beginning as the most desirable: direct acquisition by the State as park land. Gloucester County was the only county out of 21 with no state park facilities. When approached, state park officials were positive about the idea, but wanted local partners to manage the park and to contribute toward acquisition costs. Getting three municipalities and the County on board with this idea, and simultaneously coming up with enough money to satisfy GIBG, would not be easy. Other alternatives included having GIBG receive Green Acres money itself, having GIBG donate part of the property for a tax write-off, converting part of the property to commercial use, and having a private conservation entity take ownership. Bringing Ron Jaworski and his celebrity power to the table was also considered. All of these were pursued to some degree by Friends members, but some outright failed and others seemed highly unlikely. While Friends members were busy talking to government officials and fundraising at public events, the property itself continued to transform into the sought-after nature preserve, looking less like the golf course it once was. Local residents continued to use the property as a de facto park to walk dogs, catch fish, and get a little peace and quiet. The Nature Club began bringing busloads of birders to the property for its annual Bird Quest event each May. In early 2012, various pieces of the state park idea fell into place. First, the State agreed to contract with Gloucester County for property management, which would in turn subcontract to Mantua Township. Second, Friends member Christine Nolan was able to construct a plausible funding plan involving multiple Green Acres applications, some direct State and County funding, grants, and private fundraising by the Friends. Plausible did not mean certain or complete, however. The Friends were tasked with raising a total of $125,000, of which only $75,000 had been achieved by that time. The small penny donation jars that the Friends had placed in local businesses and government buildings were not going to close such a large gap. With the assistance of two private donors, the Friends crafted a $10,000 donation challenge that ran during May and June of 2012. Also in June, Friends member Delor Cornell hosted a lavish outdoor fundraising dinner at her Wenonah home that attracted 145 people and raised over $12,000. A few days later, the $10,000 donation challenge was completed successfully. By early August, after adding in other donations, the Friends fundraising total had soared past $141,000. This late fundraising success may have helped forestall a threat by GIBG to begin constructing their development in July if a sale agreement could not be reached. Around this time, some of GIBG's original development approvals from 2007 began to expire. Yard sign distributed by the Friends starting in September, 2010. 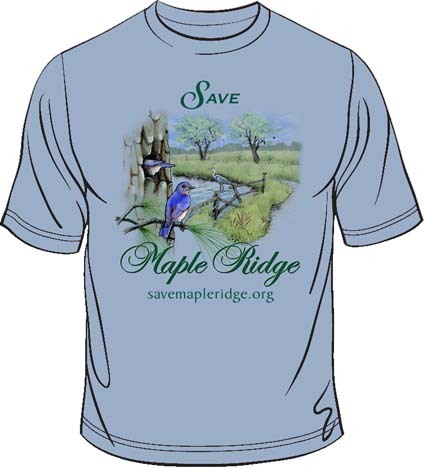 T-Shirt sold as a fundraiser at public events starting in mid-2011. in May, 2012. This is typical of many outreach efforts during the years 2010-2012. Shows a Friends meeting at the Wenonah Community Center in December, 2012. In mid-2012, a legal complication arose regarding affordable housing (COAH) units that GIBG had agreed to build in Deptford: the State was unwilling to advance Green Acres funding unless these anticipated units were removed from or relocated within Deptford's plan. For its part, Deptford was unwilling to change the plan due to several ongoing COAH lawsuits. Friends member Suzanne McCarthy devised a creative solution that involved subdividing off a 2-acre parcel that formerly contained the golf course's clubhouse, and then assigning all of the COAH units to that parcel. It took until June, 2013 to fully implement this plan. Lawyers for the State and GIBG finally were able to begin negotiations on a purchase agreement. While this was underway, the Friends organization began planning its future. Looking at similar non-profit park organizations around New Jersey, it seemed desirable to apply to the State to become an Officially Recognized Friends Organization (ORFO). While this process could not begin until the park actually came into being, questions about the structure of the Friends group needed to be answered. How could a membership-based community group be built to survive over time, given the inevitable peaks and valleys of volunteer interest? After taking some steps in the direction of becoming an independent 501(c)3 group, it was decided that the Friends should become a committee of SJLWT. This would allow ORFO recognition to occur much sooner and with lower expenses than if the Friends were a completely autonomous organization. Just as the State began environmental testing at Tall Pines in September, 2014, a legal agreement between the Friends and SJLWT was on its way to being formally approved. It was believed then that a park opening could be mere months away. It was not to be. Soil testing revealed one spot on Mantua side of the property with a high concentration of the banned pesticide chlordane. While waiting through the winter for news about the state-directed remediation effort, Friends members continued meeting monthly, discussing topics such as fundraising events, logos, mapping, and a park management plan. While the final name of the park was not known, “Tall Pines State Park” was used on internal communication, reflecting members' desire for a return to the golf course's original name. By mid-2015, chlordane remediation was complete, dilapidated maintenance buildings had been torn down, and a Mantua Creek foot bridge that inexplicably led off the property was removed. State, County, GIBG, and Friends representatives did a final walk-through on July 7th. Formal closing of the purchase occurred on November 5th and was announced by the State in a press release the next day. In February, 2016, the State decided to name the park Tall Pines State Preserve. Accordingly, the Friends changed their name to the Friends of Tall Pines State Preserve. On the first day of summer, June 20th, a dedication ceremony was held next to a newly-installed entrance sign for the property. Department of Environmental Protection Commissioner Bob Martin was the keynote speaker. Friends Chairman Rich Dilks and SJLWT Executive Director Christine Nolan also spoke, reminding the audience of the sustained citizen involvement over a period of 8 years that made the park possible. The entrance sign for the Preserve, with the sizable parking lot (inherited from the golf course) in the background.